Charles Bukowski is the master of laying it all out. Here, he talks of writing. But you can easily apply this advice to just about anything. Music. Acting. Painting. Accounting. Anything. you.there is no other way. This should be posted in all high school guidance counselor’s offices. Good advice from a great poet. Except for the last part of it (writing) doing it (writing) by itself, I agree.If only my writing could simply write itself. That would be a neat trick. I’m not a huge Bukowski fan, but this is pretty damn good advice. Pop: Wish I’d had this advice when I was in high school.Digital: A great poet? Okay. I agree.Daisy: This is the type of life lesson that crosses the generation divide.Annie: I think he means that “writers” don’t have to force the issue the way civilians have to.AFM: There’s plenty where this came from. 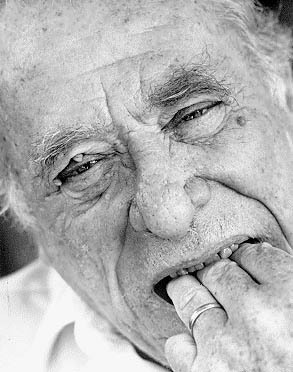 Time for a second look at Bukowski? CB is the man. No one else comes close. except maybe John Fante occasionally…..
nurse: John Fante! You and I are seekers on the same path. Great advice. To the point, and from the guy at the end of the bar.